The humble subject has as long a history in still life painting as the assemblage of luxury items, and – from Roman wall-paintings to the present day – bowls and baskets of eggs have been depicted quite as often as silver platters of lobsters and porcelain dishes of grapes. Eggs are so familiar that the task is to make them fresh and surprising; they also offer a huge challenge to the painter, because of their smooth, flawless shape, their fine texture, and their non-geometric regularity. They can be symbolic of birth, death and rebirth; they can be semi-abstracted forms within an arrangement of other shapes. They can represent a peasant’s meal, mundane shopping, the ephemeral, nature and wild life, the innocent career versus the corrupted wine jar of life. The present work is a study in minimalism. 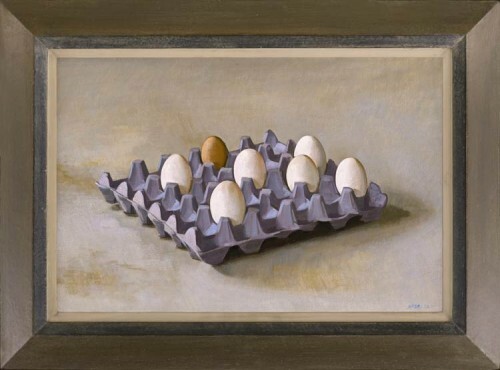 The baskets and bowls of Chardin have been replaced by today’s throwaway cardboard tray; this move has also changed the picturesque mound of piled eggs to a chessboard arrangement. Everything is pared down – shape, colour, tone, chiaroscuro. The result is an extremely subtle painting, partly abstract, partly a study in minute variations of opalescent colour.